Richard Jordan: Could Michael Ball be the last household name created on stage? Recently, Stephen Sondheim told an interviewer: “There is not enough time any longer to build stars on Broadway.” He was referring to famous film and television stars heading for limited runs on Broadway – just like in the West End – to entice audiences, when at one time the actors who built a career on stage would have been the enticing household names. Stage actors such as Ethel Merman, Elaine Paige, Michael Ball, Patti LuPone and others were once as famous to the general public as the stars of the screen. Some of them may have subsequently gone on to build a TV profile, but their careers were made in the theatre. In the West End, Rosalie Craig is the musical star of the moment. Back in November, she walked away with the Evening Standard best musical performance award for her gender-swapped portrayal of Bobbi, the lead role in Company. Her face adorns the musical’s posters and watch out for her name at the Olivier Awards, but most people in the street would struggle to name her. Mark Shenton has written about how he considers Killian Donnelly to be the UK’s finest leading man in musical theatre today. He believes the performer is a natural successor to Michael Ball. But, again, say Donnelly’s name to the general public and many will have never heard of him. Donnelly’s journey from amateur dramatics in Ireland to becoming a West End and Broadway leading man is the sort of story the press would once have lapped up. In the late 1980s, musical actor Dave Willetts went on a similar journey, from amateur dramatics – this time in the Midlands – to playing the title role in The Phantom of the Opera in the West End, taking over from Michael Crawford. It certainly made headlines at the time. So what has changed? The reason may simply be that today’s British theatre stars are not afforded the same media coverage as their predecessors, meaning the general public are simply not as familiar with them. British television used to have a litany of chat shows such as Aspel and Company, Wogan, Pebble Mill at One, Parkinson and the Des O’Connor Show. Many of these had prime time slots and would feature interviews with the stars and creative teams behind West End musicals, as well as songs performed by the cast. Today, the format of many chat shows has changed, hosted by comedians with far more focus on screen stars and pop music than theatre. At least in the US, some Broadway coverage continues, mainly with performances on the flagship breakfast and morning TV shows. But, predominately, musical and stage stars have also fallen off their prime time chat show radars on the other side of the Atlantic, unless the star is as equally well-known for their screen work. In the UK during the 1970s and 1980s, those old chat shows were a driving factor in promoting greater public awareness of the British musical, and their subsequent growth. Many of the stage actors who emerged during this period also became household names. The high profile of these stage actors may have been further boosted because it happened during an age before the proliferation of digital TV channels. Until the arrival of Channel Four in 1982, terrestrial TV offered only three stations – this meant chat shows could capture a large market share of the TV viewing public in a way networks could only dream of today. It helped that often whole families would sit down to watch these shows together. Contrast the discovery of stage stars today. Carrie Hope Fletcher, who appeared in the 2018 West End musical Heathers, drew large teenage and young adult audiences to the show partly because of her social media fame. While Fletcher is a rising musical star, her popularity is still marginalised to one particular sector of the audience. 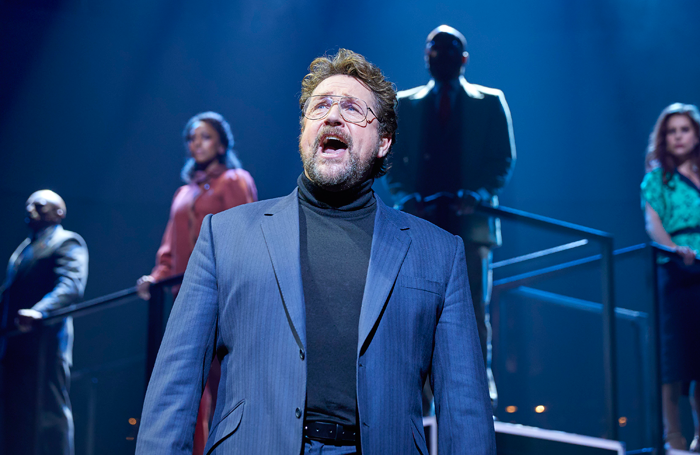 It is a marked contrast to the emergence of Michael Ball as a West End star – his name was instantly recognisable across all age ranges. At the time, Ball was in high-demand on the TV chat show circuit, but it was his 1989 single Love Changes Everything from the musical Aspects of Love, ahead of its West End premiere (in which he also appeared), that made him a household name. The song became a top 10 hit in an era when songs from musicals still featured in radio station playlists. Ball is arguably still the UK’s most recognisable musical actor, but imagine if he was the West End’s newest leading man. Suppose he made his Theatreland debut in a major musical, would it be possible as a stage actor to achieve the same level of public recognition as he did all those years ago? Is Sondheim right? Have things changed so irrevocably that fame as a leading actor on stage today cannot happen without high-profile screen roles to go alongside it? Ball has gone on to present his own TV chat show and a radio programme and star in concert tours, but alongside these, he has continued to act on stage in musicals. He may be one of the last British musical theatre stars to be recognised as such – first and foremost – by the general public. If so, it’s a disappointing reflection of the decline in exposure for musical theatre stars among the general public. Meanwhile, in 2019, this should also raise concerns about the industry’s future in both discovering and propelling its stage talent and productions forward.